Internet is filled with sites that spread malware and browsing is like walking rope above those. Antivirus and firewall are a must but they don’t tell you if specific site is safe or not. Google does. When user googles, clicks result and gets infected with bunch of malware he will say Google is at fault. Yeah, not fair. 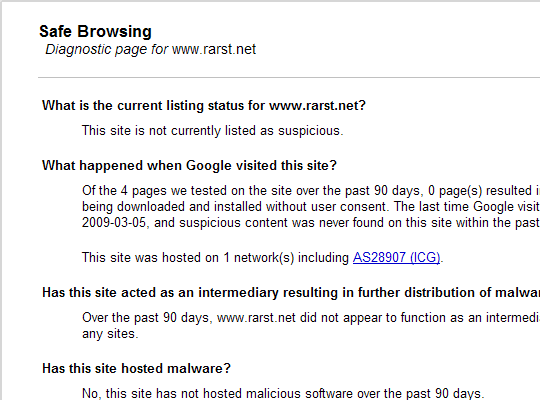 So Google keeps an eye out for sites spreading malware. Those get marked as such in search results but there is also manual check for additional information. Replace link at the end with whatever site you want to check. Not too user-friendly but easy. was it considered suspicious at any time in last three months. Worth noting that tool is pretty slow at scanning and doesn’t seem to be hooked in main Google bots. Took it months to notice my blog, long after it was properly indexed by Google. Recent addition (at least I had only noticed it today) is information on network where site is hosted. Also nice but informational value is spoiled – every single site I checked today had numerous (from dozens to over thousand) sites hosted nearby and spreading malware. No replacement for security software but decent way to check if site has or had history of harmful behavior. Well, as I wrote this tool is pretty slow at crawling. :) Or maybe it just puts priority on sites noticed spreading malware and doesn’t care much about rest.